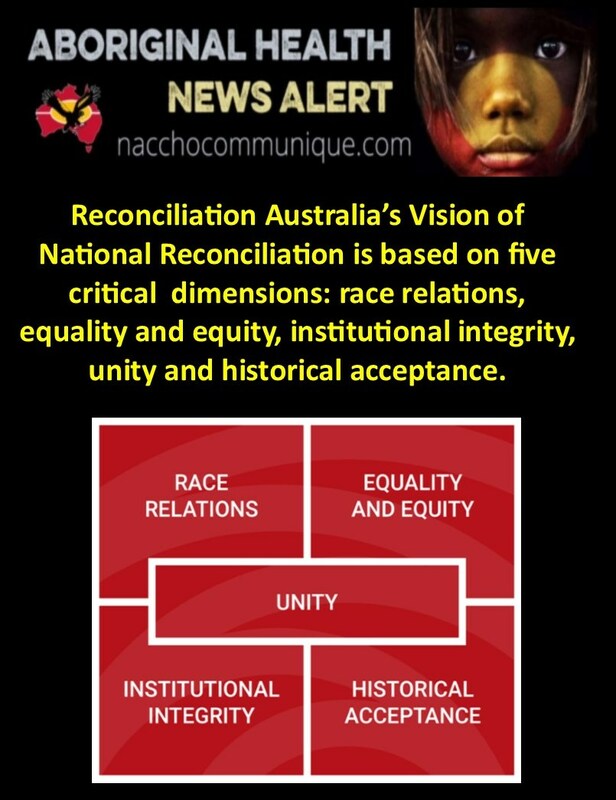 NACCHO Aboriginal Health and #Uluru #Voice #Treaty @RecAustralia Reconciliation Australia’s Vision of National Reconciliation is based on five critical dimensions: race relations, equality and equity, institutional integrity, unity and historical acceptance. As we begin a new year 2019 , it is an appropriate time to pause and reflect on our progress towards a just, equitable and reconciled Australia. Reconciliation Australia co-chair Tom Calma AO highlighted the uniqueness of the history of Australia. Part 1 : Reconciliation Australia’s Vision of National Reconciliation is based on five critical dimensions: race relations, equality and equity, institutional integrity, unity and historical acceptance. These five dimensions do not exist in isolation; they are inter-related and Australia can only achieve full reconciliation if there is progress in all five. Race relations: All Australians understand and value Aboriginal and Torres Strait Islander and non-Indigenous cultures’, rights and experiences, which results in stronger relationships based on trust and respect and that are free of racism. Unity: An Australian society that values and recognises Aboriginal and Torres Strait Islander cultures and heritage as a proud part of a shared identity. Historical acceptance: All Australians understand and accept the wrongs of the past and the impact of these wrongs. Australia makes amends for the wrongs of the past and ensures these wrongs are never repeated. Aboriginal and Torres Strait Islander peoples have been calling for treaty/ies for many decades. Negotiation of treaties and agreements by all governments and parliaments were recommendations of the final report of the Council for Aboriginal Reconciliation in 2000. Given that Australia is the only Commonwealth country that does not have a treaty with its First National Peoples, the progress towards treaty/treaties in Victoria is an important first step towards true reconciliation. A number of other jurisdictions are progressing their own treaty and agreement-making processes, and are looking to Victoria with interest. The South Australian Government had started treaty negotiations with Traditional Owners before a change of government paused negotiations. Discussions are also under way in the Northern Territory and Queensland. The constitutional convention called for a Voice to Parliament — a national indigenous representative body enshrined in the constitution. The convention also called for a Makarrata Commission to supervise agreement-making between governments and First Nations and truth-telling about our history. The Final Report of the Joint Select Committee on Constitutional Recognition relating to Aboriginal and Torres Strait Islander Peoples was handed down in November 2018. The key point of this report is that the voice should become a reality and that it will be co-designed with government by Aboriginal and Torres Strait Islander peoples for Aboriginal and Torres Strait Islander peoples right across the nation. After the design process is complete the legal form of the voice can then be worked out. It will be easier to work out the legal form the voice should take once there is clarity on what the voice looks like. The commitment to a voice, and the commitment to co-design of that voice are significant steps for the parliament to discuss and consider. They are significant steps towards a bipartisan and agreed approach to advancing the cause of constitutional recognition. With the backdrop of this progress, what can you do to work towards a reconciled Australia? Become informed about the treaty progress in Victoria and get on board to lobby and advocate for justice and self-determination for Victoria’s First Nations Peoples. Bill Shorten’s proposal for a ­republican plebiscite faces an assault from prominent Indigenous figures who are calling on Labor to dump the policy and focus on establishing an indigenous voice to parliament. 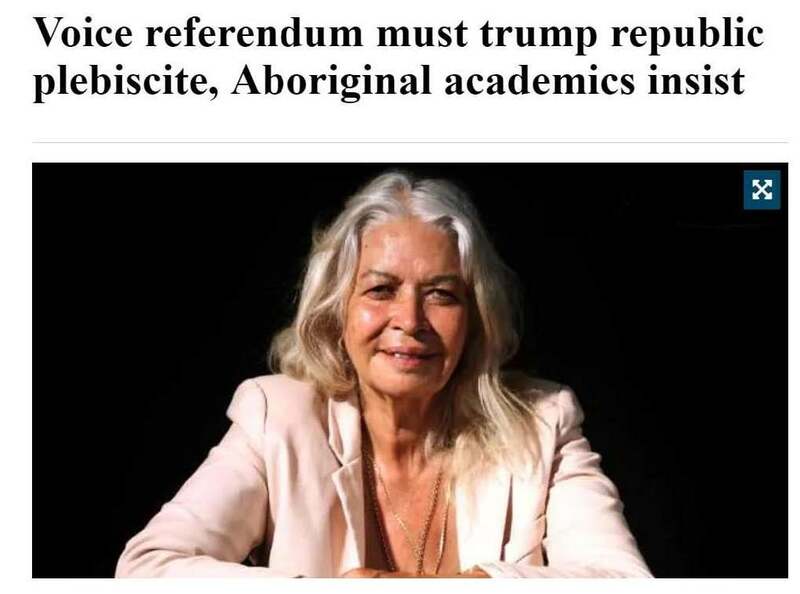 Leading Indigenous academics Megan Davis, Marcia Langton and Eddie Synot say the campaign for an indigenous voice should be given clear air. The Greens are also urging Labor to dump a first-term plebiscite on the republic, along with Maritime Union of Australia Northern Territory branch secretary Thomas Mayor. At its national conference last month, Labor committed to making the voice a priority for constitutional change but did not commit to a timeline on a referendum. Professor Langton said she had not spoken to a single Indigenous Australian who supported a republican plebiscite being held before a referendum on the voice.